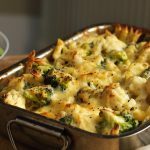 This healthy keto broccoli and cauliflower bake is a cheesy and flavorful dish! A wonderful side dish you can make for special occasions. In a large saucepan cook broccoli and cauliflower, covered, in a small amount of boiling lightly salted water for 6 to 8 minutes or until vegetables are almost crisp-tender. Drain well. Remove broccoli and cauliflower from pan; set aside. In the same saucepan cook onion in 1 tablespoon hot butter over medium heat until tender, stirring occasionally. Stir in soup, cheese, milk, and basil. Cook and stir over medium-lowheat until bubbly and cheese melts. Stir in cooked broccoli and cauliflower. Transfer mixture toa 1-1/2-quart casserole. Toss together bread crumbs and the 1 tablespoon melted butter; sprinkle over vegetable mixture. Bake, uncovered, in a 375 degree F oven about 20 minutes or until heated through.